The 2018 South African Book Fair, which will run from 7 to 9 September at Johannesburg’s Newtown Cultural Precinct, will present a diverse programme of topics and activities for visitors from all walks of life. The three-day programme of events, just released, is brimming with things to do and see for everyone from pre-schoolers to the most dedicated book lovers, including a vault of books with industry experts showcasing books that entertain, educate, empower, inform and advance. No-one is left out, as the South African Library for the Blind showcase tactile books, promoting a positive reading experience for the blind and visually impaired. Celebrating #OURSTORIES on the page, mic and stage, the 2018 Book Fair also promises a feast for lovers of the spoken word as a giant of the South African literary world will be honoured. The late Professor Keorapetse Kgositsile, affectionately known as Bra Willie, will be celebrated through intergenerational voices in indigenous languages, a commissioned tribute poem and more. The inaugural Keorapetse Kgositsile Poetry Café at the SABF will feature some of the most recognised names in the realm of spoken word. The Book Fair, as part of the National Book Week campaign which runs 3-9 September 2018, kicks off with an exciting Schools Programme, where learners, librarians, teachers, caregivers and parents will be treated to a delectable offering of storytelling in the vernac, The Little Prince and other theatre productions, and a host of activities in The National Book Week Magic Tent. The literary programme runs from Saturday to Sunday with an exciting line-up - from panel discussions with leading movers and shakers to a Philosophy Café, facilitated by prominent thought leaders, and sessions dealing with some of the most pressing social, economic and political issues facing our country today. Meet Mandy Wiener, Tembeka Ngcukaitobi, Ralph Mathekga, Christi van der Westhuizen, Mpho Dagada, Dudu Busani-Dube, Jan-Jan Joubert, David Higgs and more. The Fair also features a wealth of experts from the publishing industry who’ll be ready to assist with learning and support materials, the best research and non-fiction books from the university presses and SMME publishers from all provinces. #OURSTORIES Storytelling Festival where stories of past and current times will be told, shared and sung. African Superheroes, where young authors such as Loyiso Mkize, Bontle Senne, Clyde Beech and Benoit Knox will take the audience into the world of graphic novels. African Philosophy Café, where Prof. Gilbert Khadiagala and Prof. Adekeye Adebajo will discuss the tale of two hegemons: SA and Nigeria in Africa. In Original Sin, panellists such as Adv. Tembeka Ngcukaitobi, Dr. Nomkhosi Xulu-Gama and Dr. Marek Hanusch will explore the complex issue of land disposession in South Africa. A Celebration of Giants remembers the timeless contributions of Albertina Sisulu and Nelson Mandela as the country celebrates their centenaries. Skin Deep with Rosie Motene, Sarah-Jayne King and Thuli Nhlapo looks at adoption across racial lines. Writers Are Our Conscience explores how writers and readers influence society. Do writers steer the course of a country’s socio-political passage? Dr. Sindiwe Magona, Siphiwo Mahala, Melinda Ferguson, Antjie Krog, Maishe Maponya, Peter Harris and many more will unpack this topic. Step Into My Womanhood is where diverse woman authors such as Malebo Sephodi, B Camminga, Anne Dahlqvist and Melanie Judge will discuss their expressions of womanness. Exposed! South Africa’s Hidden Web of Crime will feature three journalists; Mandy Wiener, Anneliese Burgess and Pieter-Louis Myburgh; who will give unprecedented insights into political and underworld figures, as well as exposing how these criminal networks have infiltrated the South African enforcement authorities and agencies. Bus Tour: Hop On, Hop Off will explore Johannesburg’s uneasy relationship with its past and future. Three local authors; Terry Shakinovsky, Harriet Perlman and Nechama Brodie; will take audiences on a journey through the city’s historical, political, cultural and culinary sites, as depicted in their writings. A production of The Little Prince will be performed by the Market Theatre Foundation’s brand new theatre company, Kwasha! This performance will be a magical re-telling of the book, mixing storytelling and circus in multiple languages to create a unique South African inspired production of this French masterpiece, for adults and children alike. The full programme for the 2018 South African Book Fair, which is the final event on the National Book Week calendar, can be accessed at www.southafricanbookfair.co.za. Booking is essential and tickets for all sessions are priced at R40 and are available through WebTickets at https://www.webtickets.co.za/EventCategories.aspx?itemid=1482084984. Entry into the exhibition, poetry performances, the storytelling festival and the Family Zone will be free of charge. 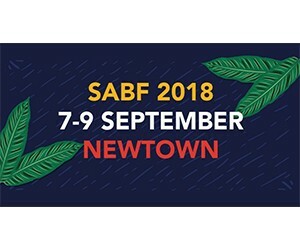 The South African Book Fair (SABF), is presented by the South African Book Development Council, in proud association with the Fibre, Processing and Manufacturing SETA (FP&M).